If I had to describe this car in one word it would be “opulent.” Pierce-Arrows were known as high-quality, high-cost automobiles for most of their existence and it’s cars like this that gave them that well-deserved reputation. It was one of the best cars you could buy in 1919. 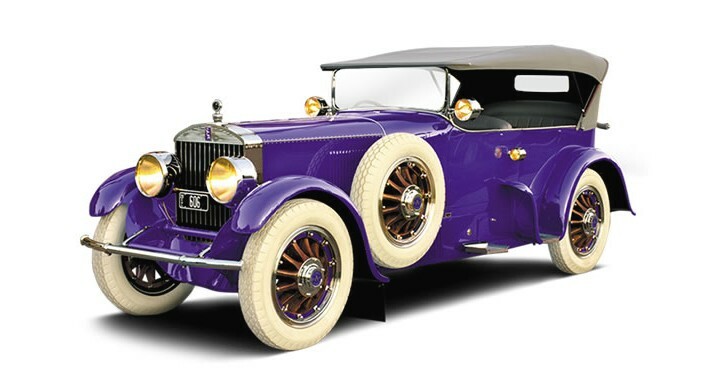 And so, legendary film comedian Roscoe “Fatty” Arbuckle purchased this car as a bare chassis in 1919 and had it shipped to Don Lea Coach & Bodyworks in Los Angeles to have this custom body fitted. At the time, the designer working for the Don Lea coachbuilding company was a young Harley Earl. The color is described as “purple-blue” and whatever you want to call it, it is certainly striking. Especially when accented with those impossible-to-keep-clean all-white tires. The Model 66 was introduced in 1910 and by 1918 it was a pretty old design. This 1919 model was one of the last built. In total, 1,250 were built and only about 14 survive today (only seven are the A-4 type). The engine is a monstrous 13.5-liter straight six making around 60 horsepower. Tom Barrett (of Barrett-Jackson) acquired the car in 1976 and a light cosmetic restoration was performed before it was acquired by the Blackhawk Collection in 1982 where it remained until 2006. It was restored completely by its current owner, winning first-in-class at Pebble Beach in 2007. This is an exceptional automobile with a storied history and a one-of-a-kind look. For more information, click here. This entry was posted in Uncategorized and tagged 1919, a-4, auctions, barrett-jackson, cars, classic cars, model 66, pierce arrow, tourer by classiccarweekly. Bookmark the permalink. Where was Roscoe Arbuckle’s Pierce arrow found? I read that Tom Barrett purchased it in 1976 , was it stored after Arbuckle’s death? Just curious. Good question. I really don’t know where the car was for the 40 years between Arbuckle’s death and Barrett’s acquisition. You gotta believe it was just “some old car” to somebody though.